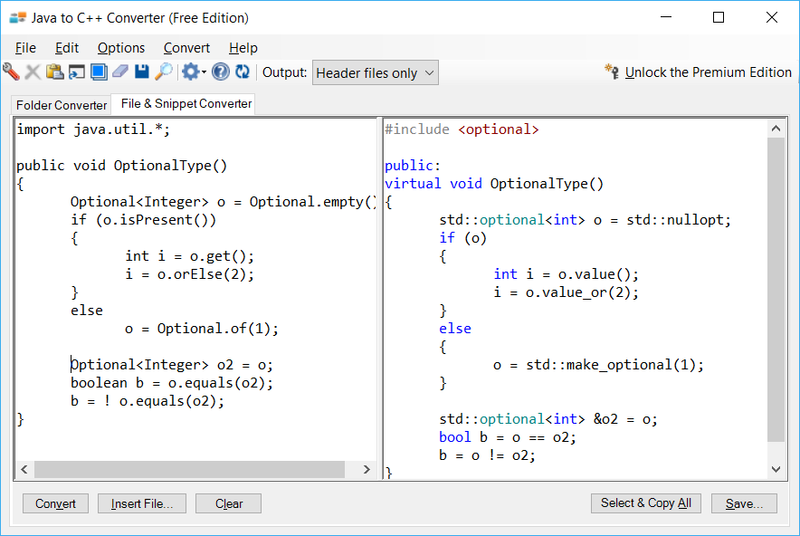 Java to C++ Converter produces great C++ code, saving you hours of painstaking work and valuable time. 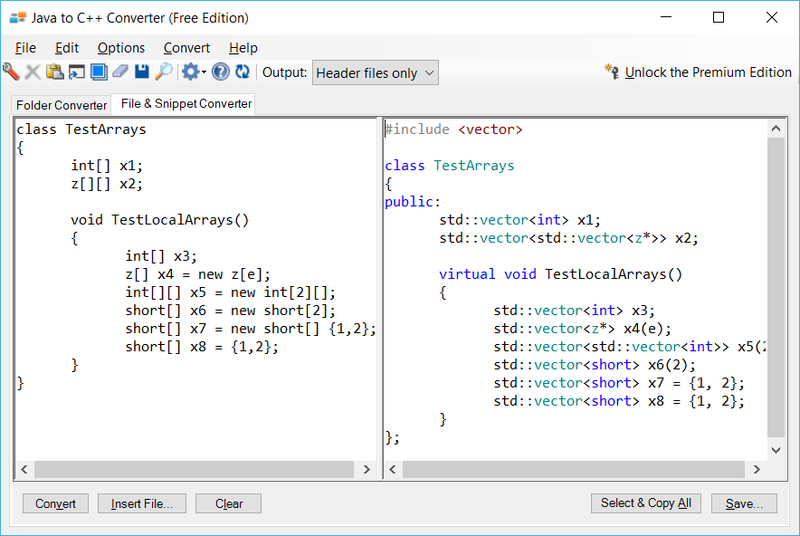 *Scroll right to see Java to C++ Converter in action! Q: Are entire folders converted? 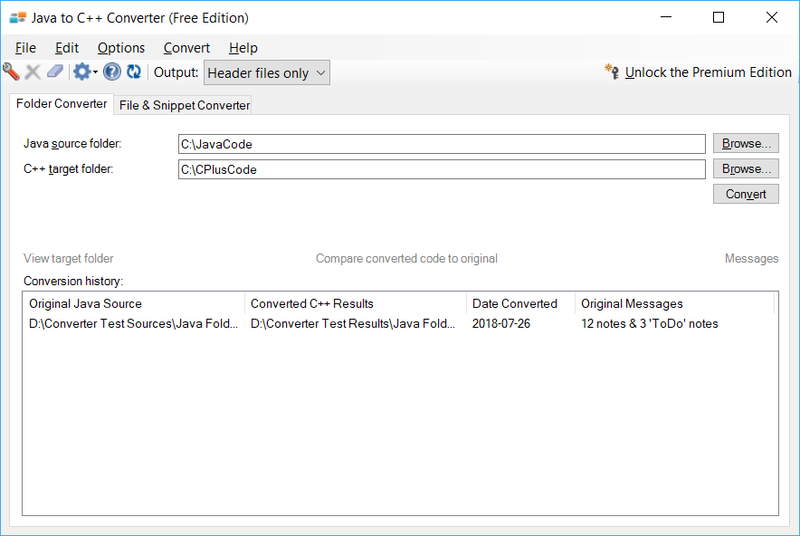 You can select Java folders to convert. All ".java" files within that folder will be converted and written as either combined declaration/implementation header files or as traditionally separated .h/.cpp files to the directory you specify. 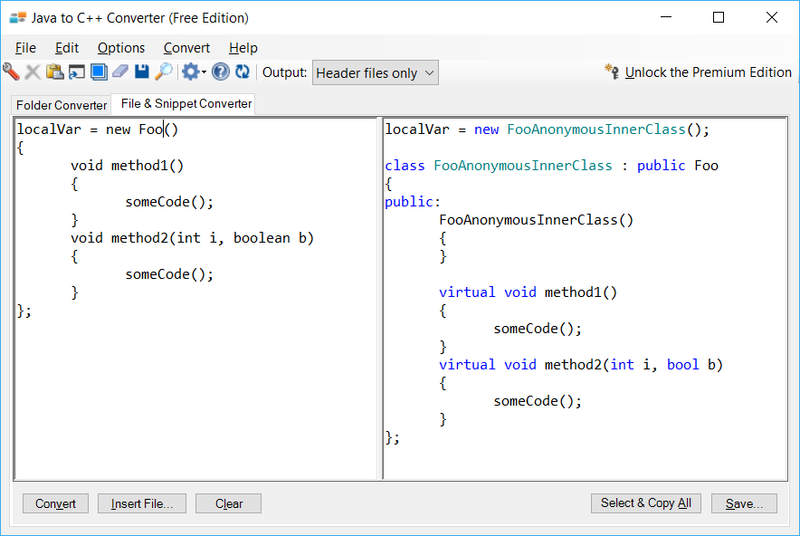 However, Java to C++ Converter does not construct the new C++ project file (e.g., the .vcxproj file in Visual Studio). This is due to the lack of one-to-one correspondence between Java project types and formats and C++ project types and formats. Q: Is the original Java code altered in any way? Our accuracy is the highest in the industry, but there will be significant adjustments required for all but the simplest conversions. There are no direct equivalents in C++ for some aspects of Java. Read the rest of the FAQ to get an idea of a few things that are not converted. 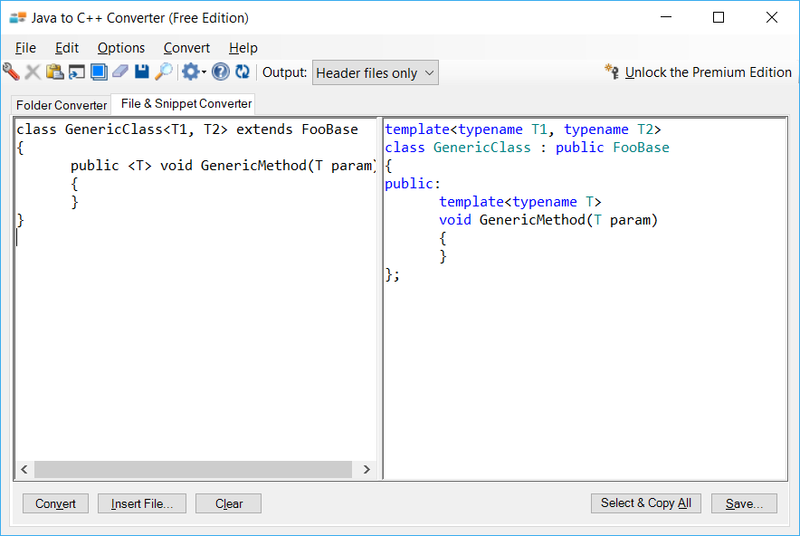 Java to C++ Converter is intended to reduce the amount of work you'll have to do to convert code to C++, but it is just the first step. Anonymous inner classes are converted to C++ nested private classes, but if the interface is a functional interface, then the interface is converted to a function pointer typedef and the anonymous inner class is converted to a lambda. Yes - try out our Free Edition to see the conversion details. We optionally convert Java functional interfaces to C++ function pointers. Most Java platform or library function calls are not converted. However, we do convert a subset of the Java string, keyboard I/O, math, and utility function calls. Also, many Java container classes are converted to C++ container classes, depending on the output option selected. 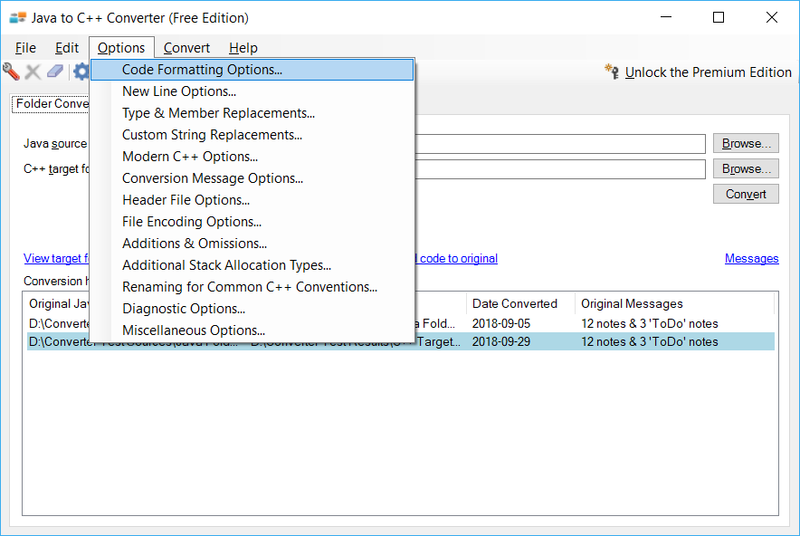 The converter offers options to use your own custom replacements. Same class constructor calls are not supported in C++ prior to C++11. If you don't select the option to preserve same-class constructor chaining, these cases are marked with "ToDo" comments. Java to C++ Converter cannot ensure proper deallocation of pointer variables. In some cases, a call to the delete operator is made, but in general complete memory deallocation is not included in the conversion. However, the converter contains options for converting to smart pointers. Java's event handling model has no direct equivalent in C++. Java wildcard generics have no equivalent in C++, unless used in a method declaration parameter list. Java local classes cannot be declared within methods in C++. These are marked with a comment. There will be occasional qualifier symbol adjustments required. For example, it is possible that Java to C++ Converter fails to determine whether a particular Java dot operator should be replaced by a C++ arrow, double colon, or dot. If type analysis fails to determine the equivalent, heuristics are used to determine the most probable equivalent. There is no acceptable equivalent to an exception 'finally' clause. Java local final variables have no exact equivalent in C++. These are converted to const, which requires that the assigned value be a compile-time constant. For cases where the assigned value is not a compile-time constant, you will have to remove the const qualifier. 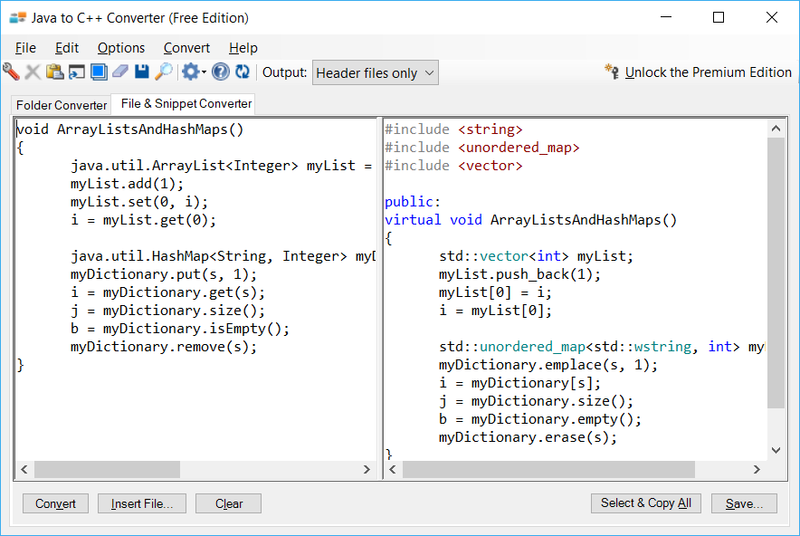 Since Java to C++ Converter does not map to a particular C++ project type, the Java 'main' method is left in it's original location and converted literally. Depending on the C++ project type, you will need to adjust the location and structure of the main method.